Learning To Crawl With An Exercise Ball, and Why Every Child With Down Syndrome Should Have One. A few days ago I posted a video of Noah trying to move forward as I held one of his favorite (and cheapest!) toys in front of him as motivation. But as you can see in that video, as badly as he (and I) both want him to crawl (or even just a little inch-worm action) he just isn’t there yet. And that’s ok. If there is one quality about Noah that stands out (other then his beautiful blue eyes, and super cute laugh) it’s that this little boy is determined! He will accomplish all of his goals…. just on his own time table. And that’s ok too. I'll crawl.....just give me time. 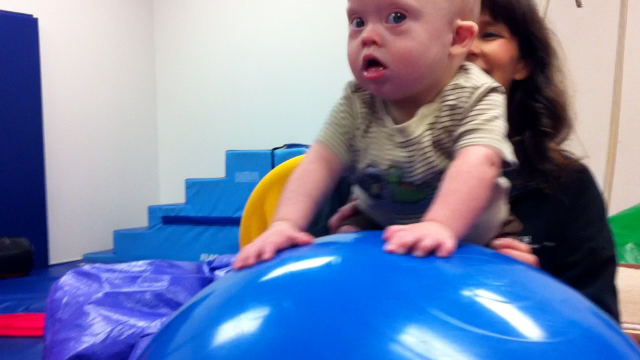 An exercise ball is one of the best tools to help a child born with Down syndrome grow and develop. Noah uses one during almost all of his therapy visits, We’ve already listed 4 reasons why an exercise ball is great for hypotonia, and shown how an exercise ball and a box of blocks can be used as a cheap and easy physical therapy exercise to help your child learn to grasp. In addition to those, an exercise ball is also useful in helping a child born with Down syndrome learn to crawl as they develop their core. This exercise ball is hard work...but it's helping me get strong! By the way, if you are interested in some great (and simple) exercises you can do at home with your child, we listed some of the best books you can buy on our top resources post. Be sure to check it out. Have you used an exercise ball with our child? What other developmental tools have you found useful? Leave a comment below and let us know. Also you should see how quick Noah can go to sleep. He’s a pro. Just wait until I get around to posting pictures of his 1 year birthday party. He was playing one second, and crashing the next…it was awesome. Noah is doing so well! James got started a little later than Noah due to his health, so he’s still working on these things. Moving to sitting and back is what he’s working on, and can do most of it all by himself now! Determined…stubborn…two sides of the same coin! I think James has the ability–we’ve seen him get in the crawl position many times–but just doesn’t want to do it! We use the exercise ball in OT and PT. His favorite is when they roll him up-side-down. This kid is going to be a dare devil. hahahah…so awesome! I love it. He sounds just like Noah. Samantha just got her ball. The therapist wanted us to start using it. I’m so nervous I just help her “fly” on it. She’s just 4 months but it has helped her with her neck support and her core. The therapist will give us some exercises in Feb.
Ha,ha..that’s awesome! It sounds like you guys are doing a great job wit her! By the way, that ‘flying’ is actually very good to help develop her core. I’m pretty sure if you look back at some of our older posts you’ll see some of the ‘flying’ that Noah did as well. Let me think….developmental tools: A boppy pillow was really helpful when learning how to sit up. I felt like the bouncy chair (the kind that hangs from the door frame) was helpful in developing leg strength. The bumbo chair also helps when learning how to sit and helps support and practice neck stength. And most importantly, I think just getting down and playing with your baby and encouraging different positions, and “roughhousing” a bit is helpful. We would throw julian a lot up in the air (not too high of course) and hold him up and make him put weight on his legs on our chest, and also when he was a tiny baby I would lay him on my lap and lift him up by his arms so his head had to follow – of course you have to be careful with this too. But basically, I moved my baby a lot and didn’t really coddle him much. =) He got plenty of cuddles of course and gentle love…just not all the time. Those all sound like great suggestions. Thanks so much for sharing them. I forgot to mention: I love how your posts link back to other posts. You have put up so much salient information over the last year, and I enjoy catching up on it all. So I don’t mind if you’re still posting vids from Sept. I feel like I have so much more to read about! Ooh…the archives…it’s like finding a treasure chest! Sweet! meimei just started crawling last week!! the tunnel has really encouraged her crawling and the leap frog table really helped in pulling to standing. That’s so awesome!! Thanks so much for sharing. We are so proud of your little girl. She sounds so awesome! Keep up the great work, and please keep filling us in on her progress. Well today Enzo had PT and we went ahead and asked the PT about using the exercise ball. Well, it was fun. Enzo was definitely breathing hard from all the work he was doing on the ball but we could feel his muscles work. Thanks so much for the tip! He is getting so strong and we love seeing him stepping right with Noah at that age! So awesome!!! He is getting so strong, I love it! Why yes I did. I’ll post to Facebook! The exercise ball is my absolutely favorite “tool” to use. Not just the round but also the peanut one, which I like to use to help Alyson practice standing (surprisingly it doesn’t roll away). Outside of the exercise ball, I found that a shallow tub/bucket is another inexpensive versatile “tool” to have around. We’ve used it to help Alyson learn to put her toys in and take out (cognitive skills). We also fill it with water for some sensory water play. We also turn it over so Alyson can learn to sit while bearing weight on her legs (which helps with standing). Its also a good position to have her learn to pull to stand, especially if you have a tall toy (or favorite person 😉 ) in front for her to grab on to. And let’s not forget good old fashion banging. Mychelle has the best answer imo. I caution parents from putting too much emphasis on the tool vs. the skill of the therapist using it. I do have to say that there is nothing more rewarding then your child exceeding new milestones everyday! I have two typical children and yes the mlestones that they made were great, However with Tyler and his diagnosis, I think that it just means that much more. I am so proud of my Ty everyday! He is doing so well and he just keeps amazing me more and more everyday. 🙂 Noah is ADORABLE!!! I love watching your little videos. Thank you for sharing them. I am so glad that I found this website. You have some great ideas. My little guy; Jacob is almost 15 months old and belly crawls all over, but I would like to see him crawl. So I asked his pt to show me how to use the exercise ball and it is work for us but the good news is he is starting to move forward on all 4’s about 3 to 4 times. Thank you for posting all your information on your little guy; Noah. He is so sweet and cute! I look forward to all your updates.